Many homeowners dread the day that they hear the words “black mold” in relation to their home. Black mold, sometimes known as “toxic mold,” can be a scary term to hear. When identified, black mold can have negative effects associated with the respiratory system. In some extreme untreated cases, can cause death. The most common symptoms from mold exposure are sneezing, itching skin, skin irritation, watery or itchy eyes, and headache. Fortunately there are many ways to identify black mold in a home and treat it properly. There are also many cautionary steps you can take to prevent black mold in your home. Black mold removal should always be completed by a professional. 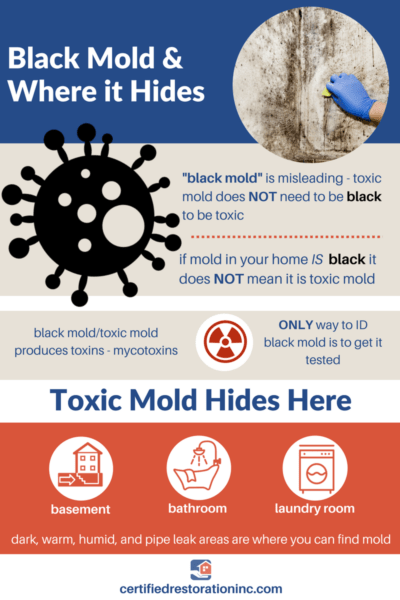 First, it’s important to know what exactly makes up black mold. Black mold is a type of mold that can produce toxins, more specifically, mycotoxins. This means that just because mold is found in your house, does not mean it’s black mold. This type of mold growth can be triggered by a moisture issue or water damage event in your home. Additionally, the word “black” is a little misleading. Toxic mold does not necessarily need to be black in color, and also, just because mold IS black, does not mean it’s toxic mold. The only true way to know if mold is toxic is to get it tested by a professional. Where Does Black Mold Appear? Toxic mold will most commonly appear in areas of the home that are usually warm, damp, and/or humid. Areas susceptible to this are usually towards the lower portions of the home, such as basements or crawlspaces that may have small leaks from water sources. Black mold may also pop up in bathrooms that are not well ventilated or in laundry rooms if a leak occurs. Be sure to regularly check possible problem areas in your home to ensure there is no leaks, dampness, or mold growth. The earlier you able to identify mold growth, the easier and cheaper it will be to remove. As far as black mold removal goes, it’s best to call a professional in to properly treat the problem and ensure every part of the mold is removed safely. If not treated in the correct way, mold can spread within walls unnoticeably and become a bigger, more expensive problem to fix as well as cause serious health issues. At Certified Restoration, we have the proper equipment and training to deal with black mold restoration in your home. We respond to all emergencies at any time of the day, no matter how big or small. Don’t hesitate to call us if you find signs of mold in your home!